Specially designed for forestry felling professionals, this boot is made entirely from leather for comfort, waterproofing and optimum safety; there are 5 layers material including Kevlar® fibre guaranteed to jam the chain of a chainsaw operating at a speed of 24 m/ second (Level 2) and protect against all risks of cutting. The very stable HI-CI sole has EXTREM4 wide crampons and provides perfect grip on wet or icy ground. High quality materials: waterproof full grain smooth leather with no side stitching, complete full grain leather lining, leather bellows tongue to ensure waterproofing, highly abrasion-resistant insole lining. Solid: laces are made from ultra-strong waxed cotton using a special fray-resistant weaving technique. Much stronger eyeholes and hooks especially suitable for lumberjack trades. 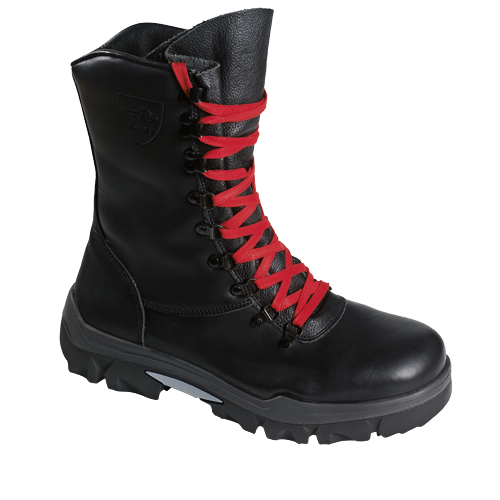 Safety: tongue made of leather padded with 5 layers of material including Kevlar® fibre protects against cuts. Velcro strips ensure it remains in position.